The CVTS is a Europe-wide survey that takes place every five years among companies with at least 10 employees. In 2015, 4 100 Austrian companies from manufacturing and services sectors took part. 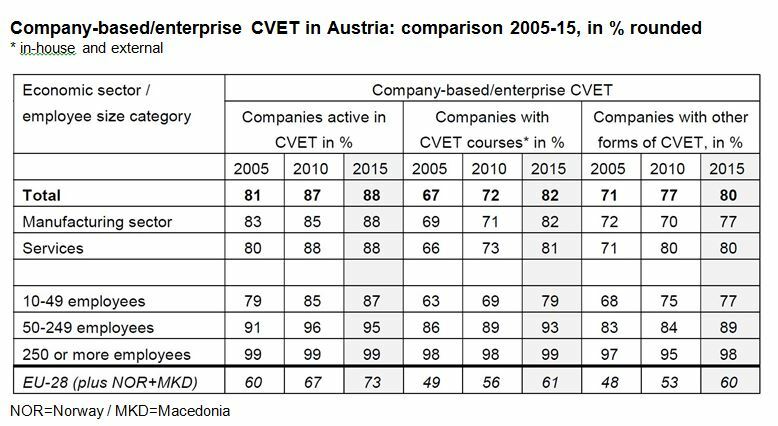 The CVTS5 shows that participation in CVET among employees in Austria steadily increased from 2005 to 2015 for all companies, with small enterprises recording the highest increase. In 2015, 88% of Austrian companies with a minimum of 10 employees encouraged their staff to take part in CVET activities, an increase over 2010 (87%) and 2005 (81%). CVET participation by employees of small companies (10-49 employees) increased by 8%, the highest since 2005. CVET activities were undertaken during paid working hours and were at least partly funded by companies. This high share of companies actively involved in CVET is above the EU-28 average of 73% and puts Austria in the top bracket together with Latvia, Norway and Sweden. 82% of the companies offer in-house and external CVET courses to their staff, up from 72% in 2010 and 67% in 2005). Again, small companies experienced the highest increase over the years, up 16%; in 2015, 79% offered CVET courses to their staff. In 2015, 80% of the companies also offered other forms of company-related CVET, such as participation in conventions, conferences, workshops and trade fairs, one-to-one training on the job, or participation in learning and quality circles. This is also up on previous years, from 77% in 2010 and 71% in 2005; small enterprises recorded the highest increase at 9% greater than 2005. NB: The ‘Total’ considers next the percentage and the number of enterprises in the different categories; in 2015, the percentage of small companies was 83%, of medium sized companies 14% and of large companies 3%. Apprenticeship training as an in-house initial VET pathway is not counted as company-based/enterprise CVET. Source: Statistics Austria, continuing vocational training survey (CVTS); for EU-28 database query Eurostat (15.11.2018). Overall, the number of companies enabling staff to take part in different forms, on different contents, of CVET increased from 2005 to 2015 and small enterprises recorded the highest increases. Small and medium-sized enterprises (SMEs) form the backbone of the Austrian economy: 99.7% of all companies in this country are SMEs. These 328 900 companies employ roughly two million people and generate sales revenues of EUR 455 billion. SMEs contribute significantly not only to employment and economic growth, but also to initial and continuing vocational education and training.